We usually don’t notice how many household items are tough to fix . . . until one breaks. A broken part, even if it’s small, can render an entire device unusable. That makes too much of what we own, essentially, disposable. 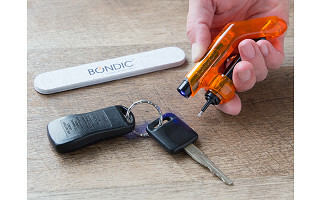 But now you can repair that clip or bracket—and almost anything else—with Bondic, a liquid plastic welder. Bondic isn’t a glue; it’s much better. First, Bondic dries by using the attached UV light, which hardens the substance in seconds. But even better, it won’t dry UNTIL you use the light. So you can figure out exactly how you want to repair a crack or bolster a weak area and only apply the light when you’re ready. No need to apply pressure, either. If Bondic reminds you of the adhesives dentists use, it’s not a coincidence. In fact, one of Bondic’s founders is a DDS, and he realized that the fast-drying substance had many more uses beyond tooth repair. Rebuild entire missing areas by layering Bondic. Or fill in a molded area. This wonder substance can even be sanded and painted after it hardens. Fix toys, eyeglasses, jewelry and more. Bondic works on wood, metal, and even fabric. Use it for craft projects or to enhance existing products, like adding a GoPro mount to a bicycle helmet. Add this liquid bonder to your toolbox, and your handiness will know no bounds. Hello Grommet community! We are thrilled to be launching Bondic, the world's first liquid plastic welder, and happy to answer any and all questions you have. We answered a few from Mike of The Grommet team which you can find below! Here's the million-dollar question, why should I, or anyone else, buy this over glue? Bondic™ does what glue can’t do. It’s a cool new way to fix hundreds of things that could never be fixed by a glue. I have yet to meet someone who hasn’t been frustrated with glue. I also have yet to meet someone who saw Bondic cure for the first time and didn't think it was the coolest thing ever! What were some initial challenges you faced developing Bondic for a mainstream audience? The hardest part was the formula. How do we make something work for most conditions and scenarios? How much adhesion should we use? How can it be cured quickly? What is too quick or too slow? Each one of those combinations would change the clarity. And the list went on for years with more criteria compiling as we got closer. And of course, this is all falling under the number one criteria: make it as safe as possible so just about everyone could use it. 5 years later, here we are! What do you see as the most common applications for this? Do you have any favorites that you've seen? Just when I think we have seen everything we get to see something new. One of my favorite applications was one of the very early ones. Rockefeller University called. They needed to mount bugs on tips of these sticks so that they could observe the bugs while alive under a microscope. Using glue required pressure and time and too often the bugs shell while super strong for the bug in relation to their size, got crushed under the pressure to hold it there until the glue dried. Bondic™ enabled them to put a drop on the bug, hold the bug near this special stick or post and have no contact with the bug and the stick. Only the drop of Bondic™ was the common denominator. Now they didn’t hurt the bug and could replicate this procedure in 4 or 5 seconds and it was a far better solution. Another cool thing that happened was that friends of friends who work here grabbed a cab in the city. The driver was friendly and chatty and the conversation turned to the fact that a few minutes ago he wasn’t able to get them but because he has this cool new stuff he was able to temporarily fix a leak or puncture in the cars vacuum hose or line in a few seconds he got his cab going and was able to continue working and not lose the income that evening. That cool stuff was Bondic™! But every day of every week people find a new application from boats and secret government agencies to crafts and hobbyists its simply fascinating to know that we have a product people are genuinely excited to use or find a use for. @Adam Will it bond to walrus ivory? I have a small peg to repair...about 2 inches by 1/4 inch. You will have no problems bonding to ivory as long as the surface is rough. Just keep in mind that on a smooth surface, Bondic can be picked off, the surface area needs to be rough so the Bondic material can seep into or "grab" it to create a strong hold. @Adam i've used this for a few things from repairing a clip on a spa filter to a wire harness on my tv (they usually just come w/ a simply adhesive pad which lasts about a week). my first few tries were challenging but still successful. however, the formula tubes seem to be a little fragile. i keep the kit in my tool bag and it somehow opened just enough for the contents to shift and bust open the spare tube. while i can still use the formula mopping it up and spreading it on the intended surface, it is terribly messy and i do need to purchase more. that aside, this stuff is awesome! What do you expect the feedback from the community to be like? Based on experience and retail and consumer shows and events and with zero ego and total honesty, I expect it to be a hit! Bondic™ appeals to everyone who likes cool things. People who have lots of cool things have cool things that are broken and Bondic™ is the one gadget that can repair all the other gadgets we own. I always travel with one, I have one in the car, cottage and a few at home. My kids have used it on school projects and I have used it to fix probably 30 or more things around the house or office that would have otherwise been thrown out or left unused without a Bondic™ fix. I am curios as to the "hardness rating" as well as the flexibility. Do you have any specs on that. Amazing idea- industry has used UV cured adhesives forever, but nobody ever thought to bring that to the consumer! WELL DONE! 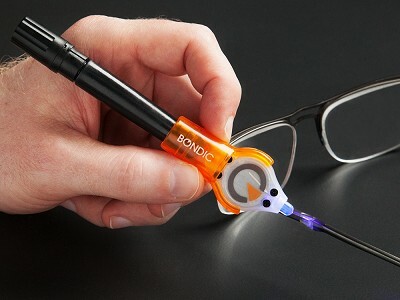 I do not have exact specs that I can share with you but Bondic's hardness rating will mimic that of a polymer plastic. After cured, just think of Bondic as plastic, no different than any other plastic product in your home. If you want it to be flexible, you can just create a thin layer that is easily bendable (roughly .5 - 1 mm thick. If you want it to be strong, you can build upon itself to make it hard. I hope that helps, let me know if you have any other questions! @Adam What is the level of concern with exposure to the bonding light? Just about zero, Ariel. As long you don't stick in your eye or anything, you'll be good! I wanted to try Bondic on an inside piece of my gas grill. Will heat affect its ability to work? It depends on where the piece is located. After cured, Bondic has a temperature range of -40°C to +150°C anything above or below this range may cause Bondic to melt or crack. If you can confirm that the area of repair will not exceed these temperature ranges, it will function perfectly! Are there refills available or do you have to purchase an entirely new package? We sell replacement refills and replacement UV lights so you do not have to buy an entirely new kit every time. 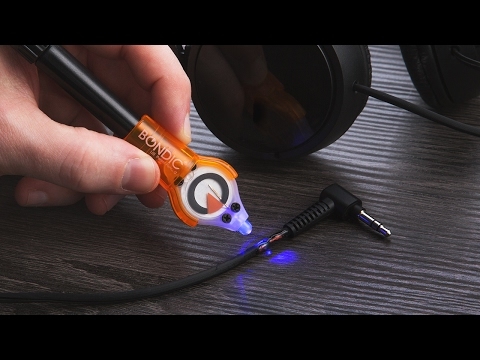 The black tube (Refill) and the UV light are both removable items that can be swapped in and out of the orange holder you see in the video. @Adam HOW MUCH PRODUCT DOE'S IT HOLD AND HOW MUCH IF NOT THE SAME IN THE REFILL?? Bondic's cartridge and refill cartridge are the same size, holding 4g of fluid, which is roughly 200 drops of Bondic fluid. @Adam How long does the UV light usually last for? Will it work on china or pottery? Absolutely! Bondic is perfect for creating new material or bonding broken material back together. The best part is that Bondic is waterproof so it is perfectly safe to use in the dishwasher. After cured, Bondic is also considered "non-critical" also making it safe to use on dish ware (just make sure you wash the repaired item before using it to clean off any missed residue). that side without getting any allergic reactions to your mouth and lips? Hi Ariel, you should have absolutely no problems unless you have allergic reactions from plastic. On what surfaces can Bondic be used? Wood? Leather? Others? Bondic can be used on almost every surface; metal, wood, plastic, glass, ceramic, fabric, etc. Just keep in mind that on a smooth surface, Bondic can be picked off, the surface area needs to be rough so the Bondic material can seep into or "grab" it to create a strong hold. Check out our YouTube page for 100's of videos of repairs on all materials. Just to note, leather may not give you the results you want because it does not have any fibres to soak into. Will the plastic adhere to metal like,a broken eyeglass frame? Wha t kind of plastic is it and what size repair is its strength limitation? Considering putchase. Excellent jdea. Bondic will adhere to any surface as long as it has been roughened up or if there are grooves/holes/rivets for the material to grab onto. Though Bondic does has a certain sticky property to it, it does not function like glue. With that said, before bonding any objects you must roughen up the surface with a nail file then begin curing in layers. What is the UV wavelenth ? Shoud we wear UV blocking glasses? @Art will I get my fingers stuck together as usual? To answer the first question, I cannot give out the exact wave length, but as always being airing on the safe side is the best policy. Keeping in mind that the light coming off the LED is in milliwatts and not focused its not laser dangerous as those beams are focused. Secondly, if you are shining it at the fluid the light is being refracted, reflected, absorbed etc. So less than what comes out of the LED in total is being split up. If you were to do these repairs as an occupation then yes, wear the appropriate UV eye protection for UV. But also keep in mind that going outside without sunglasses on a sunny day and you have far more exposure to all UV wavelengths at far higher powers than this little LED UV device. To answer your question @Christopher, Bondic does not stick to your skin, it can be easily removed with soap and water. Remember that it is not a glue and will not work like one, it functions more closely to that of a 3D printer. Even if you cure it on your skin with the UV light, it will simple solidify to plastic in 4 seconds and come right off. How about sealing a small hole in a leather chair? I know it won't close it up, but will using the product make it less likely for the hole (from cat claws) expand? And do you know if it will cause the leather to pucker? There should be no concern over puckering while using Bondic at all. Let me know if that helps and if you have any other questions. How long will the bonding liquid last in the container when the pen is not being used? As of now, the fluids shelf life is indefinite (it is only a couple of years old and we have yet to have experienced a tube drying up or hardening). It is not like a glue that will dry up in the tube, only our special UV light or sunlight will cause the material to harden. Because our container is a sun resistant material, the fluid will never dry up and always be ready for use. Would this work on leather? Like a leather sofa at the seam has separated. Would it bond it back together? I need to repair a separation in my leather seat. Would this be a good fix? A new seat is $250....NOT in my budget. Sorry to repeat an answer but Yes, it would just require some additional effort! Hi, I noticed while watching the video, bonding to the glass aquarium underwater. How did that work out? Is this successful for bonding two broken glass surfaces? (I realize that this is for plastics) I also noticed that it doesn't dry clear. Is that something that could be in the works? I already have things I can fix with this!! Bondic actually works on almost every material; metal, wood, glass, plastic, ceramic, etc. You can check out 100's of repairs on our YouTube channel for ideas: www.youtube.com/howyoubondic. Bondig two broken glass surfaces would work out just fine because glass is transparent, allowing the light to pass through it. The Bondic material does have a slightly opaque colour to it, but the benefit of it is that it can be painted afterwards! What is the shelf life of the product? Does it dry out over time? When my dentist uses the "dental version," he uses a UV shield over his eyes when curing the filling. Why isn't that a concern in the Bondic version? Good question. The light your dentist uses is much more powerful than our UV light. Safety is of course our number one policy, but keep in mind that the light coming off the LED is in milliwatts and not focused its not laser dangerous as those beams are focused. Secondly, if you are shining it at the fluid the light is being refracted, reflected, absorbed etc. So less than what comes out of the LED in total is being split up. If you were to do these repairs as an occupation then yes, wear the appropriate UV eye protection for UV. But also keep in mind that going outside without sunglasses on a sunny day and you have far more exposure to all UV wavelengths at far higher powers than this little LED UV device. @Adam As a Safety Manager that works with uv lasers we have occasional need for uv light protection. Weak sources of uv light, such as the diode used here, can use eye protection from an ordinary pair of polycarbonate safety glasses (3mm thick is the US safety spec.) Attenuation will be about 6 or 7x and, of course, visible light still gets through so you can see what you are doing. Any hardware store will have this product. Excellent information, thank you for sharing that with us. Does Bondic work on joining glass surfaces together? Glass does not seem to be listed in the current descriptions. Thanks! Definitely! Bondig two broken glass surfaces would work out just fine because glass is transparent, allowing the light to pass through it. Is this toxic in any way? Fumes? After cured, Bondic is considered "non-critial" making it perfectly safe to use on any material, including your dish ware. You may experience some fumes omitted off the material when cured during its chemical reaction (which is just the fluids evaporating), but it is only for literally a second and they instantly dissipate into the air. I want to use this to bond metal and glass. The metal button that holds my rear view mirror in my car on the windshield keeps falling off. Will this hold? The replacement kits for the auto stores only hold temporarily. Bondic would work in this scenario as long as the surface is rough. Just keep in mind that on a smooth surface, Bondic can be picked off, the surface area needs to be rough so the Bondic material can seep into or "grab" it to create a strong hold. Is the light UV or Blue? It is a UV light, just a concentrated ray from the sun. I'd love to use this to repair a torn electrical cord attaching it to my dehumidifier. Is your product a conductor of electricity? Bondic is an insulator, we suggest low voltage, under 24 volts where the amperage is low. I have a laminated layered glass table. The top layer has cracked. Does the liquid dry clear? Bondic is relative transparent, it will have a slight yellowish tint to it (You can see it here: ). It can however, be painted and sanded down once cured. Can you send me info about selling it and promoting it? Thank you! Can you contact [email protected] regarding your questions and outlining your credentials and someone will respond to you as soon as possible. 1. How long does the welder itself last? Is it battery powered? If so, what type of battery? Is it replaceable? 2. The included 4ml of liquid is almost trivial if we plan to use it as shown in the demo--to fill spaces or build structures and $12.59 per 4 ml replacement cartridge is rather steep. The main issue here is cost, imo. At about half the stated cost, I'd buy, but as it is, I will hesitate. 1. As of now, the fluids shelf life is indefinite (it is only a couple of years old and we have yet to have experienced a tube drying up or hardening). It is not like a glue that will dry up in the tube, only our special UV light or sunlight will cause the material to harden. Because our container is a sun resistant material, the fluid will never dry up and always be ready for use. With regards to the UV light, you will get 8 hours total use out of it, keeping in mind you are using it 4 seconds at a time. It is battery operated and takes just a coin cell CR2016 battery that is replaceable, but it can be cheaper to just buy our UV light depending on where you purchase the batteries. 2. I do understand your concern on price, but considering the multitude of uses in relation to the cost of one tube is actually very good. In 4g, this will amount to around 200 drops of fluid, meaning you could repair 20-30 glasses, fill in 20-25 stripped threads or one expensive repair like on DJ headphones. In the future we will offer larger quantities, but I can promise you will not be disappointed for the price and the amount of use you get out of one tube. what is the shelf life of the unused/uncured product? Once cured, Bondic holds the same shelf life as any other plastic product, which will be 100's of years. Once it is plastic, it will remain plastic forever. Hi Adam, Will Bondic work on all plastics? I have a rear windshield wiper arm (plastic) that broke from a basketball impact. Gorilla glue failed, likely due to such a small surface area. I'm hoping Bondic will work permanently. It's an semi-flexible automotive plastic on the outside of the vehicle, shaped like a U channel.. In this case, I would begin by roughening up both ends of the wiper and creating a very thick layer of Bondic by layering and curing repeatedly. The thicker it is and the more surface area that is covered the stronger the hold will be. @Adam Thanks for your reply, Did that repair in the video use only one pen of Bondic? Is yes, how much was left over? Can I use it to fix that broken plastic part on my waffle maker? That'd be awesome. @Melissa I just noticed the apple power cord in the picture, my husband's breaks all the time. We might have to get one of these. Could this product be used to fill in a small chip on a car windshield? I cannot say yes to this question because we can in no way recommend it to be used on a motor vehicle for safety issues. This is GREAT product! I just wandering ,HOW LONG will it keep? Thinking of storing it for Christmas gifts(early shopper). If it does keep for a long period, I plan to order MORE! THXS! for such a great product! I just this morning discovered that our fish tank is leaking from somewhere. Not even sure where yet, but no matter, this seems like it might be just the ticket. How does it interact with water prior to being cured? Will I need to empty the tank to make the repair? Bondic works just fine even when water is present. With that said if you have the option to remove the water first, I would recommend doing so. This will allow you to shape it perfectly after it has been cured. Hello, I would like to know if this works on PVC pipes as well. I have a piece in my dishwasher that has broken, but hasn't rendered my machine inoperable. Bondic would work great for this application, just ensure you roughen up the surface of the pipe all the around the crack/hole. Then create a wedding band around the entire surface to the Bondic reaches around the pipe and grabs back onto itself. And the million dollar question: being derived from tooth bonding glue, can this still work as a tooth bonding glue? With that said, another question: what if the area to be glued isn't in direct view of the light? Like if you're bonding together two flat pieces of wood, what happens to the center area that isn't directly exposed to the light? Though this product was derived from the dental industry we can not recommend using it in your mouth for obvious safety reasons :). To answer your next question, if the light cannot reach the fluid, it will not glue. Don't think of Bondic as a glue that sticks two pieces together. Think of it as a 3D printer that creates new material around, in or over the objects. So in your scenario of the pieces of wood, Bondic would have to surface around the two pieces to join them together. Does it work on stone and is it waterproof once cured? It depends on what you are trying to do, but Bondic will work on stone if it is slightly jagged/rough so the material can stick onto it. And Yes! Bondic is 100% waterproof. What is the electrical conductivity? I am thinking about using it in assembly of printed circuit assemblies. How exciting! I have a pair of expensive glasses with a broken arm. Glue didn't work at all. If I can still find them, I'm excited to try Bondic. And I can think of a hundred other uses for it. Well done! Thank you for the kind words! Just make sure you roughen up both sides of the glasses arms before using Bondic and it will work perfectly! How many repairs can be made (approximately) with the 4 ml of liquid material? How can I obtain additional Bondic liquid and what is the cost? How long (approximately) does the LED light last? Are protective glasses (like dentists use) necessary? It depends, In 4g, this will amount to around 200 drops of fluid, meaning you could repair 20-30 glasses, fill in 20-25 stripped threads or one expensive repair like on DJ headphones. You can obtain additional fluid from The Grommet directly or our website www.notaglue.com. We are also present in retail chains across Canada and rolling out in the U.S.A. by the end of the month. The LED light will last you approximately 8 hours for total use and remember you are using it 4 seconds at a time. You will not need glasses for using Bondic but safety is of course our number one policy, but keep in mind that the light coming off the LED is in milliwatts and not focused its not laser dangerous as those beams are focused. Secondly, if you are shining it at the fluid the light is being refracted, reflected, absorbed etc. So less than what comes out of the LED in total is being split up. If you were to do these repairs as an occupation then yes, wear the appropriate UV eye protection for UV. But also keep in mind that going outside without sunglasses on a sunny day and you have far more exposure to all UV wavelengths at far higher powers than this little LED UV device. Does this dry clear or opaque? Keep in mind that you can paint Bondic after it is cured too! Will this work on a tear in vinyl. I do cell phone repairs and often need something like this during the course of the repair! How much does the adhesive expand, if at all, when it's hardening? The fluid will not expand at all. When you first drop it out of the tube it will mimic a honey like substance that will flow into cracks. However it forms when it is liquid is exactly how it will cure in its solid state. I have an airstream trailer that has dings from hail damage. will this glue attach to the aluminum skin with sufficient strength to permit the use of a 'small dent puller'? Once the glue is set on the aluminum skin, is there a way to remove it without messing up the aluminum skin that has just been straightened? I apologize but I can only give you a hypothetical on my answer for this as we have never tested it in this regard. In theory, Bondic would not have a very strong hold on a smooth surface like aluminum, but if you roughed it up with a nail file, it would hold very well. The problem is that this would cause damage to your trailer (which is exactly what you are trying to avoid). 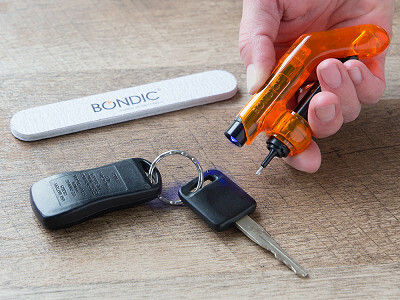 To remove Bondic from a smooth surface, its as easy as picking it off with a blade. A rough surface would need added attention and would have to be filed off with a nail file/dremmel/etc. In my best opinion, I do not see Bondic as the write solution for this. Sorry I could not help you more on this subject. If I can help out on any other types of repairs let me know. What color does Bondic dry? I have an elephant tusk that the point has been broken and have not found any thing that will glue it back together . Do you think this will do it? The Bondic material does have a slightly opaque colour to it, but the benefit of it is that it can be painted afterwards to match the same colour of the tusk. Just keep in mind Bondic is not a glue and won't work on two flat surface, you will have to create new material around the tusk "bonding" it back together. Once you have done this, you can use a nail file and shave down the material to whatever size you want. Does it only work on plastic things or can it be used to "weld" metal? Just keep in mind that on a smooth surface, Bondic can be picked off, the surface area needs to be rough so the Bondic material can seep into or "grab" it to create a strong hold. With regards to metal, you would have to use a thicker layer of Bondic around the two pieces due to the added weight of the material. I have a silver Hanukkah menorah and one of the candle holders broke off. I tried, unsuccessfully, to glue it back with superglue. Do you think Bondic might work? Sorry if this is a repeat, but if one uses it to make repair, how long will the typical repair last? Also, what is the "shelf life" of the product? Is it like super glue and dries out quickly? Refilling options? What is the shelf-life of an opened container of Bondit? I have a dresser with fixed metal drawer pulls (cast aluminum I suspect) and 2 of the drawer pulls broke right in half. Would this product bond the 2 halves back together & hold it tight enough to use the drawer pulls again? The sections where they broke are about 1/4" in diameter. Bondic would work just fine in this case. Just make sure you roughen up both ends of the handle then create a relatively thick layer of Bondic around the entire surface areas of the two pieces, literally creating new material to hold them together. Hi, Adam. I recently replaced my radiator in my vehicle. The plastic end tank developed a crack/leak. Could I/should I enlarge the crack with a rotary tool (a v shaped groove for the bondic to have penetration below the original surface? It's a hassle to remove and replace the radiator so I want to make a permanent repair. Would coolant/heat/pressure affect the Bondic? I can only answer this in the hypothetical because we cannot recommend using Bondic for anything outside of cosmetic repairs or uses that will directly affect the engines performance. You do not need to enlarge the crack as long as Bondic can flow into the seems of where the damage occurred. If it does not seem like Bondic is in far enough then you should proceed with your suggestion. The coolant will have no effect on Bondic, just ensure it does not exceed its temperature range of -40°C to +150°C. Will it work to fill in granite countertop chips? Definitely! Just add a drop of Bondic about .5mm thick and let it flow into the crack, then add the UV light to cure it. Continue doing this is layers and build up the material until you have reached the top. Once you are done, you can file/sand it flat if it is not perfect when you finished. I am having a hard time visualizing this repair, would you mind sending a picture to [email protected] ? From what I can gather, you have two broken glass parts that you want to stick back together, so you would be able to sand both sides then add layers of Bondic, put the pieces back together and then shine the UV light through the glass to cure it? Really cool product! Where can the refill cartridge be found, and how much does it cost? What is the shelf life? Would love to get a couple tubes but don't have an immediate need. Thanks! Nevermind! Saw an earlier inquiry! Perfect! Let me know if you have any other questions! Bondic has a temperature range of -40°C to +150° once cured. A basic rule of thumb is to try and stick to cosmetic issues away from motors/engines and if you are going to go down this route, only use Bondic as a replacement for a plastic part that has already proven to be able to withstand the conditions of the items you listed. This looks like a terrific product. I have some rings that are just a little big for my fingers but not big enough to get re-sized. I noticed you said that without roughing up the surface before applying, it would be easy to peel off. But if I apply it to the inside of a ring, which I would not rough up first, would it remain adhered even as I put the ring off and on? Do you recommend using it for gold and silver jewelry? We actually have clients that do this now. Keep in mind we cannot say this will be permanent, but because Bondic is so easy to use it is very simple to just add another drop just incase it falls off the jewelry. Ha! You are exactly right! Could Bondic be used to patch pinholes in a PVC pool liner? Absolutely! One really cool feature of Bondic is that is waterproof and can work underwater, so if you put the UV light in a zip lock bag or something transparent and waterproof, you can swim down to the tear and place a drop of Bondic on the hole and cure it through the zip lock (to make sure the light does not get wet)! You've referred to using Bondic to repair a stripped screw-hole. How would this work? I would like to repair a stripped hole on my laptop, but the screw has a flat end - how would I get the screw into the repaired hole? This would be a bit trickier but still possible. You would have to begin by filling the hole with Bondic, layering it up until you have reached the top. You would then need to use a screw to create a new hole inside the Bondic fluid so the flat tip can be used again. I have a metal fence/gate meant for baby proofing that I use to keep my dog out of the living room. It uses molded plastic pieces to hold it together - including the hinge piece at the corner of the gate. This broke into two pieces, and I have yet to find a glue that works on this plastic for more than a day (epoxy, various plastic glues and plastic "weld" from a tube, gorilla glue,...). So, I use duct tape, replacing it every month or two as it rips apart. BTW, the surfaces at the break are irregular, not particularly smooth. So you think that Bondic would work here? Hi Steven, to give Adam a break, and he can correct me if I'm wrong, but this sounds like a textbook perfect usage for Bondic. It works especially well on surfaces that aren't smooth so it has something to grip. @Mike is completely right, it sounds like this piece comes under a lot of stress though. So I would suggest creating a thick layer of Bondic around the broken areas. The thicker you make it and the more surface area you cover the better. If the pieces are already rough then Bondic will have no problem grabbing onto it. Are there refils or do yoiu just use the unit until it runs out of the bonding material? If there are refils, how much are they? And if no refils, how many small items like the iphone cord do you believe it can fix, one unit that is? I'm laughing because I'm watching all your cool videos on my Mac whose cord is completely wrapped in electric tape because of all the times I caught it in my reclining chair mechanism! I'm purchasing today for that reason alone. But I also have a Nintendo DS whose hinge is cracked - a common point of failure. Will Bondic fix that as well? I am in the same boat as you - that repaired iPhone charge cord in the video is powering my computer as we speak! I just wanted to make sure... Will this work on joining a broken piece of glass? I have a piece of Crystal that has broken and I am hoping this will fix it. Using Bondic on transparent parts like crystal or glass is the only instance where Bondic can function like a glue because the LED light can penetrate the surface. I would also recommend putting a small layer around the outside of the broken item for added strength. Hi. We live in an older home, and have soldered windows. Will this work to fix two 12x15 panes (2 broken, how many would it take, please?). It has to be WAY less expensive than the $500.00 quote we got! Could you describe where the glass is broken? Are you referring two 2 glass panes that are in front of one another that have separated from the framing? And are you referring to 12x15 feet or inches. On behalf of the Bondic team, we would like to thank everyone for the questions and support today and for this amazing opportunity through The Grommet. We are very excited for the future of Bondic and it is through all of you that have made this possible. Let me know when the sound works on the video and I might like to order it. Hi Miki, I'm not having any trouble hearing it on my end. What are you trying to watch it on?